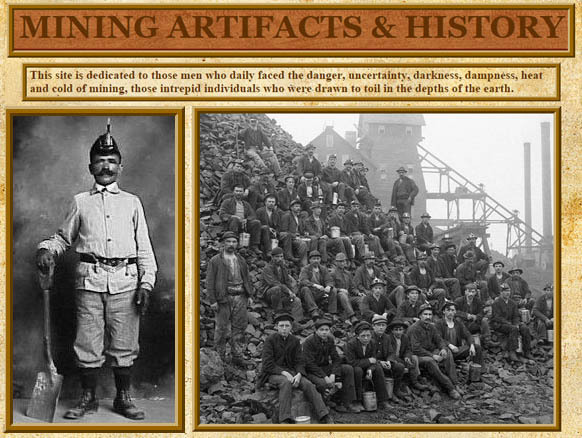  See Also Durham Mining Museum Links Page => Mines, Archives, North East Village History, General History, Local Visitor Attractions, Local Sites, Local Newspaper Sites, Miners' Banner Groups, Miners' Compensation & Help Groups, Other Websites. The pages for England, Scotland and Wales have some images of life underground and surface images of various rescue teams. 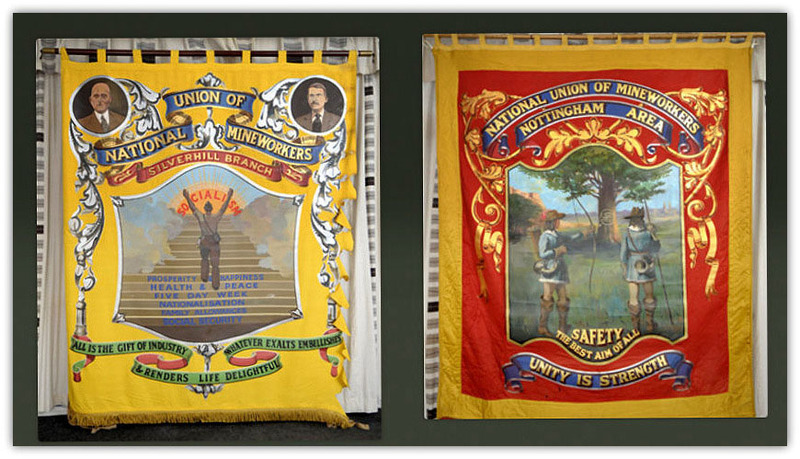 The Nottinghamshire Coalfields Banners Trust was established to ensure we retain the vibrant heritage of our coal mines. If you would like to help, have any comments or resources that you would like to add to our web site then please do so via our blog or by contacting us. Thank you. Miners Advice - On our Contacts page you'll find the NUM Office or Advice Centre nearest you. Mines Rescue UK - Phil Clifford - Much has been written about coal mining, it's effect on the health and welfare of individual miners and their families and, in recent years, the story of conflict with subsequent governments. What is less well documented is the history of the Mines Rescue Teams involved in many of the tragic disasters which were, sadly, all too common. In these few pages I hope to begin to rectify this omission. I am also compiling a book which will go into greater detail but, in the meantime I would use this medium to impart a taste of what is to come and invite you to contribute, criticise (constructively) or even correct me where you feel errors have been stated. 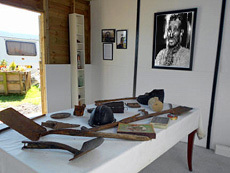 Visitors to the site will find much material relating to individual 'heroes' and pit disasters. The site is not large enough to contain detail of every disaster but more information can be obtained by visiting the 'links' page. A full listing of awards of Albert, Edward and Empire Gallantry medals is included (for deeds relating to mining only), together with information relating to the George Medal, George Cross and the Order of Industrial Heroism. I am happy to carry out simple searches of my records to provide more information for any of the named individuals. 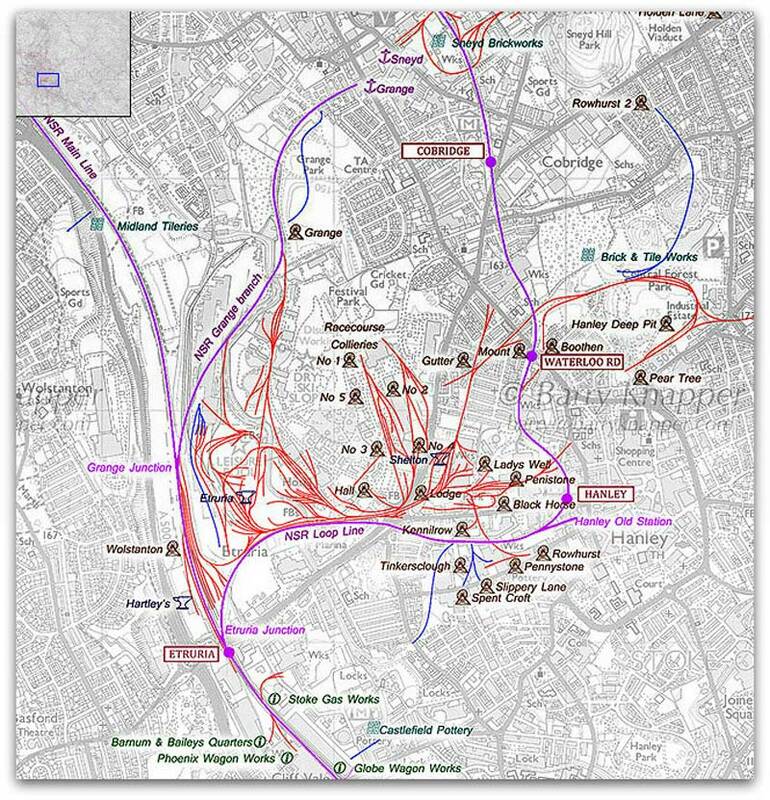 Interactive Map of the old railways which, among others duties, served all the mines in North Staffordshire. Over the TEN years between 1875 and 1885 there were 12315 recorded deaths in UK coal mines! Over the SINGLE year 1999 to 2000 the UK's Health and Safety Executive report ( Link) there were NO fatalities underground in British coal mines. 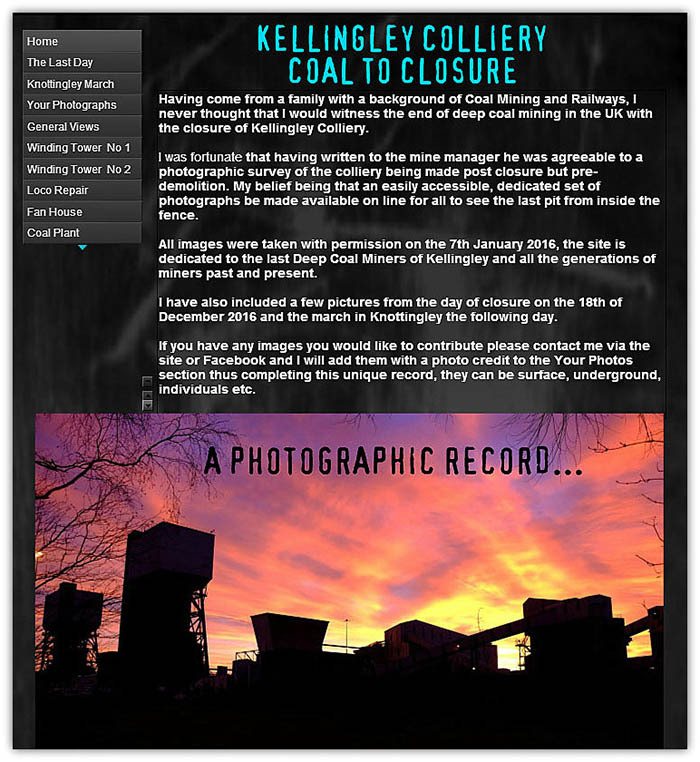 Fred Gething’s website The ‘Thurcroft Main Colliery and Village Web Site’ is dedicated to the many Men and Women who have worked at the Pit over its 80 years life. The aim of the site is to log as much information as possible regarding the Pit, its work force, it's Village and the many aspects that was everyday life for the Miners their Family's and the whole community. Welcome to the Cwm Community Care Website. Cwm Community Care is a volunteer group working to enhance our local community so that we can have a better and cleaner area to live in and to enjoy the natural surroundings and history we have in our area. To learn more about Cwm and our projects, please visit our site. World Coal Association (WCA) is an international non-profit, non-governmental association based in London created to represent the coal industry. 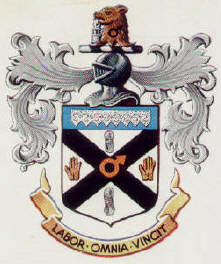 The association was formerly called The World Coal Institute (WCI), but changed its name in November 2010. The WCA undertakes lobbying, organises workshops and provides coal information to decision makers in international energy and environmental policy and research discussions, as well as supplying information to the general public and educational organisations on the benefits and issues surrounding the use of coal. It also promotes clean coal technologies. It has participated in a number of United Nations and International Energy Agency workshops, boards and forums, including the UN Commission on Sustainable Development, the UN Framework Convention on Climate Change, the IEA Working Party on Fossil Fuels and the IEA Coal Industry Advisory Board. It is also part of the Carbon Sequestration Leadership Forum. A blog which includes links and information about walks in Nottinghamshire & Derbyshire. As part of this I am including links to other sites with information about the areas covered in each blog post. I run the Coal, Colliery and Mining Forum, an open forum for anyone to discuss coal or any type of mining. We have over 160 members now, mainly UK mining based, but there are world wide boards within the forum. 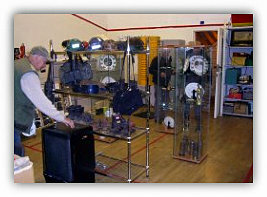 Roger is a Fire Service Historian and Author, he is preserving the history of the fire service in Britain and Ireland. He has a lot of material but is still looking for more historical information and printed material about the British fire service, its fire engines and equipment; anything in fact that will help him in his project to record part of our heritage before it is too late. AditNow is an information sharing resource and discussion forum for the mine exploration community as well as industrial archaeologists, researchers, historians and anybody with an interest in mine exploration or mining history. The site provides a searchable database of mines and quarries from across the UK, comprehensive information and thousands of mining photographs and documents. In-Bye I left Chandos School in Netherfield, Nottingham in 1956 when I was 15. I hated working in a factory and wanted something more adventurous. The Youth Employment Officer suggested the National Coal Board where there were plentiful opportunities for training. I attended an interview and medical at Gedling Colliery and was signed on as a Trainee Miner - My experiences in the Nottinghamshire coalfield. Chik.coalfields heritage initiative Kent is a website about the Kent coalfield contains brief history of the pits and lots of photographs. Our goal is to provide an informative and factual site of the history of the women working in the mines of the United Kingdom. A wealth of pictures, stories and information from its' Royal Charter in 1267 to the Mapperley of today. 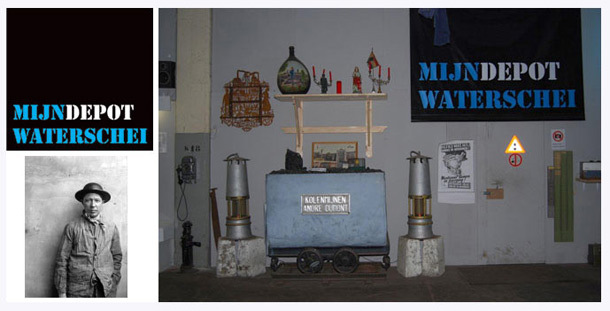 Dave Johnson Huge site, collection of mining artifacts and memorabilia, photos. Mainly America. Advise given about aretfacts, lamps etc. Miners Advice You'll find the NUM Office or Advice Centre nearest you. Their Contacts page has telephone No. 's and addresses of Advice Centres and Union Offices throughout the UK. Read about the present situation in the UK's remaining coal mines. Neils Local History Site. Coal & Ironstone Mining in North Derbyshire. 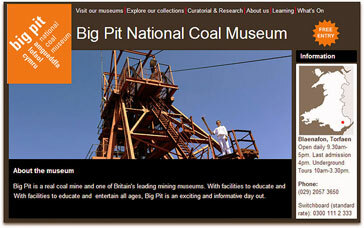 Lots of information about pits and mining companies in the Derbyshire area. Ilkeston and District Local History Society - The Ilkeston and District Local History Society was established in 1966 to foster the study of local history and research into all aspects of the history of Ilkeston and the district and to disseminate this information for the benefit of the public. Our ancestors were sons of the soil, coal and iron. I have an extensive database of events from 1576 up to those involving our families who were living in 1901. I may have information about your relations to pass on and I would like to add any facts given by you. Joel Porter has been documenting the Blenkinsopp mine and miners before it closed and has some excellent photographs. He has also been trying to get some interest locally to exhibit the portraits, or even to publish them. John Weedy's Collection of the Illustrated London News magazine. It which was first printed in 1842 and is the finest pictorial example of a historic social record of British and world events up to the present day. 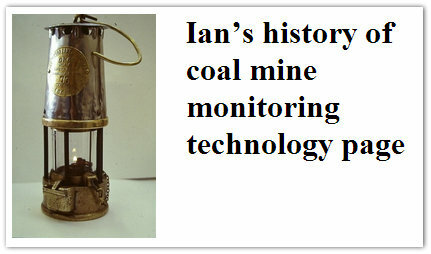 Jack Nadin's Lancashire Coal Mining History Page My interest is in the history of coal mining, mainly in Lancashire, but also in the U.K. in general, and I also have a keen interest in local history of the Burnley area, Lancashire, England. The first comprehensive study of Thrybergh, Dalton, and Ravenfield, Yorkshire, on the web a study of the history and people. Includes a lot of information about Silverwood Colliery. 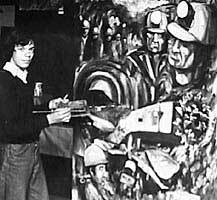 Yorkshire Main Colliery - Pete started work at Markham Main for three months underground training having left school three weeks before. Wealth of information on his site, lots of photos. 'Picture the Past' aims to conserve and make publicly accessible the photographic heritage of the North East Midlands, thus enabling people to see the richness and diversity of the area's photographic collections. Dr Roger Burt, University of Exeter. Heanor and District Local History Society. Heanor is a market town in Derbyshire, England. This site is a new venture for the Society (as of March 2004), please keep coming back to see what changes we have made. Pages include communities surrounding the town, coal mining, local industries, transport and local personalities. All of our pages include historic photographs of the area, many taken from the Society's own publications. Click here to visit the Black Gold project. It is the main official centre-point for the creative works designed to highlight and mark the 50th anniversary of the Auchengeich mining disaster. If you like poetry and stories, you will hopefully enjoy visiting my site. Painting in the Miners' Offices at Berry Hill. by the artist, pit man's son, Paul Fillingham. The Durham Mining Museum has been set up to found and maintain a mining museum to retain the knowledge and history of those that helped drive the industrial revolution and all that followed. The museum is focused on the mining history, heritage and culture of the Durham Coalfield in particular but it covers all forms of mining in Cumberland, Westmoreland, Northumberland and Durham, plus small areas of North Yorkshire and North Lancashire. The website currently contains over 110,000 pages of mining info including a list of over 30,000 mining deaths. More on their site about the museum, so very useful if you are going to visit it. The Museum is near Wakefield, Yorkshire, UK. Bilsthorpe Heritage and Mining Museum opened to the public in July 2014. Entrance is free, The museum is situated at the rear of the Village Hall on Cross Street off Mickledale Lane, off the A614 main road. Summer 10am to 4pm on Saturday, Sunday, Monday and Wednesday. 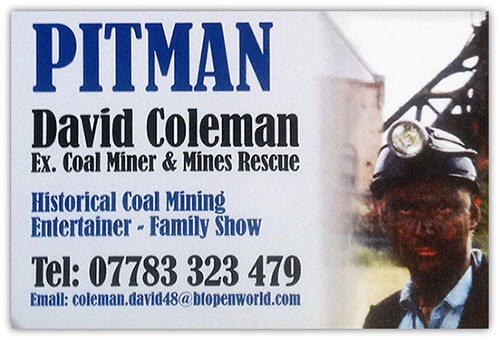 If your ever down in South Wales you have to call in and check out The Big Pit. 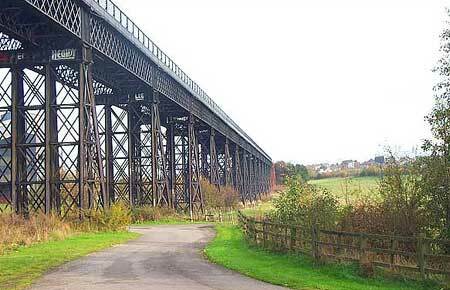 We live about half hour away and went there years ago when the kids were younger, it was good but only a short drop down to pit bottom and because of Health and Safety it was so very slow. But interesting to anyone that's never been under ground, they had two tours, one around the old stable and another more modern. On the surface they have made a gallery and it's very true to life, it is made up and covered with earth to look real and I must say they've done a great job of it, made by miners and not someone in an office and it really show. Well worth a look at if you ever get the chance and highly recommended. Scottish Mining Website. The Scottish Mining Website aims to assist family and local history researchers by providing information on Scottish miners and mining areas, compiled from old reports, gazetteers and newspaper articles. We aim to cover all aspects of life in mining towns and villages from working conditions, accidents and strikes to housing, health and leisure. The site currently contains more than 22,000 names of those involved in the coal, iron and shale mining industries in Scotland. At present, the site features information about IDLHS membership - forthcoming Society meetings and events - Society publications - and brief histories on Ilkeston, Dale Abbey, St. Mary's Church, Ilkeston's Markets and Fairs, the Local Coal Industry and The Stanton Ironworks etc. and details of other sites and areas of interest within the district. The museum is on the site of the old Woodend Colliery which has been cleared over the last two years to create the Caravan and Camping Park. Woodend Colliery was opened in 1912 and was worked until its closure in 1959, the buildings were then demolished and the site left to nature for the next 50 years. During that time it was tipped on at various intervals and as a consequence much of what lay there was undiscovered until we began our project. The museum is only small, in fact set in what was previously a stable, but this in no way detracts from the impact showing life down the mine in those days. The museum is located opposite the main entrance to Alnwick Castle in one of the oldest parts of Alnwick. Bailiffgate Museum presents for the first time the history of Alnwick and District. The people and places of North Northumberland are brought to life here in lively, interactive style, through an exploration of six engaging themes. One of fastest growing interests is in family histories of miners and our aim is to have a dedicated mining heritage centre to cover all aspects of mining in Fife. This mining museum is in Whitehaven, Cumbria, UK. Lots of photos. Information about the museum. Winding Engine. Disasters. A history of the Haig mine. Information about other local coal mines. Latest News. The City of Greater Lithgow Mining Museum Inc.
was incorporated in October 1990 to develop a mining museum at the site of the former Lithgow State Mine, New South Wales, Australia. A showcase for the industrial history of the Western Coalfields and an educational resource for the people of New South Wales. A great day out for all ages. This special attraction was created at the site of Staffordshire's Apedale Mine. Les Mason on Tel 01785 813417. 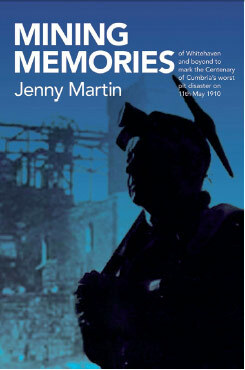 I worked at Denby Colliery 50 years ago (at the Kilburn Pit site) and have just finished writing a book documenting the history of Denby Drury-Lowe Colliery. Available in early August 2011. Should any contributor to this site require a copy they will be available at a reduced rate. Erika's photo's are a revelation but have surfaced too late for inclusion in the book. 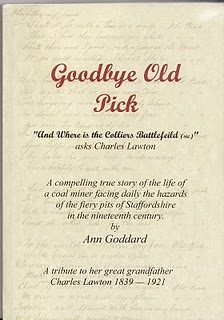 Goodbye Old Pick, a tribute to Staffordshire (later Derbyshire) miner Charles Lawton (1839 - 1921), is held to be the best account of daily life in the Staffordshire mines and fully reflects the hazards of mining life in that era. The story of the Pretoria Mining disaster by Andrea Finney, inspired by the diary of her great, great grandmother, Elizabeth Gore, who lost her son in the disaster, will be published by Peakpublish. 1910 The death of 344 men and boys at the Pretoria Pit near Bolton, England. At the time Britain’s second biggest mining disaster. 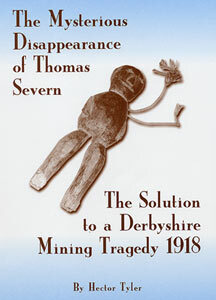 Hector Tyler's book 'The Mysterious Disappearance of Thomas Severn'. Back in 1918 a miner vanished; there was an extensive search of the mine but he was never seen again. His name was Thomas Severn, Under Manager at Mapperley Pit, Derbyshire. Hersden, Chislet Colliery Village, published in 2003. It is the story and history of a colliery and its people brought from all corners of the UK to man a colliery in Kent and the village built to house them. It includes The Birth of the Kent Coalfield, The mineworkers welfare fund and the pit head baths, Chislet Colliery Welfare Association, The Silver Band, The School, Church, Growing up in Hersden, a mining trainee, Kent pit language, to name a few, with many photos of the colliery and village events. A more compressive description can be found at buylocalbooks.co.uk. We have just published and printed locally a new book on Smalley's Past. "Industrial landscape of the East Midlands"
"A History of Mining in the Heanor Area"
I need more information. This site started off as Philip's scrap book but it is now ready to expand. As is so often the case we did not get enough information from Philip while he was alive. 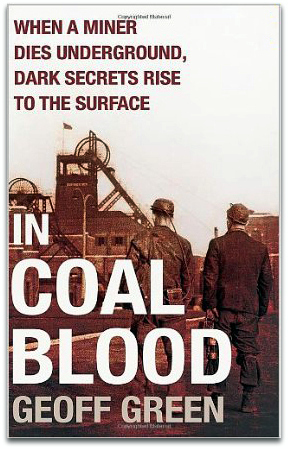 I need more stories so that those interested can find out more about the mining industry in the UK, those who worked in it and what it was like to live in a mining family, or as in Philip's case a mines rescue family.